Swallowtail butterfly | Infonet Biovision Home. The caterpillars of the swallowtail butterfly are also known as "orange dog". The butterfly is black with yellow markings on the wings, and has a wingspan of about 10 cm. They are common during the rainy season. 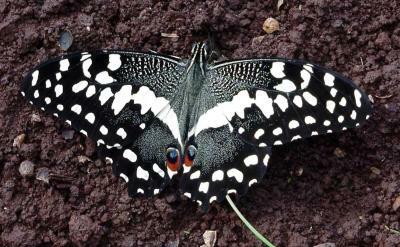 Female butterflies lay whitish, grey eggs mainly on the tender terminal twigs and leaves. The caterpillars are white-brown, or green in colour. Most spines disappear as the caterpillar grows. Young caterpillars are brownish with white patches and are spiny. They resemble fresh bird droppings. 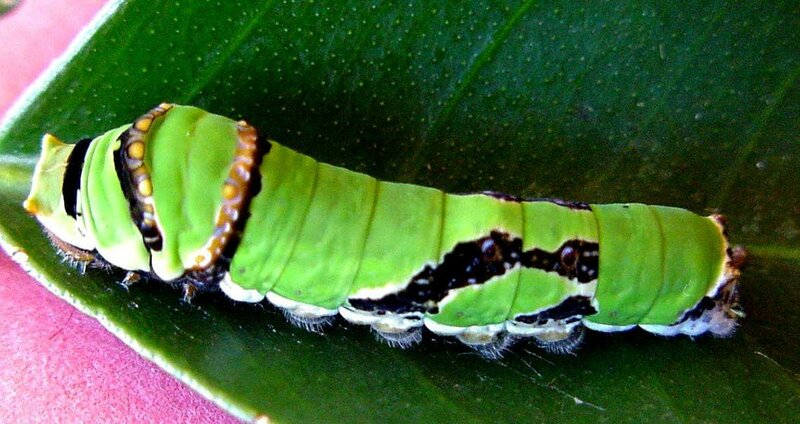 Older caterpillars are green with some light markings and two eye-like spots at both sides of the front part of the body. When disturbed caterpillars shoot out a fleshy, forked retractable organ, through a slit behind the head, which gives off a repulsive smell. Fully grown caterpillars are about 5 cm long. Caterpillars feed specially on the new growth of citrus trees. They can cause extensive damage to young trees, especially in citrus nurseries where their feeding can cause complete defoliation of the plant. Control is usually necessary on the nursery and on young trees (up to 2 years old). Several natural enemies such as parastitic wasps, and birds attack the caterpillars. Hand picking and destruction of caterpillars and eggs usually provides satisfactory control on small trees provided the plants are regularly checked.